Figure 7.3. The Freelite dot plot. CKD: chronic kidney disease; LCMM: light chain MM; IIMM: intact immunoglobulin MM; NSMM: nonsecretory MM. 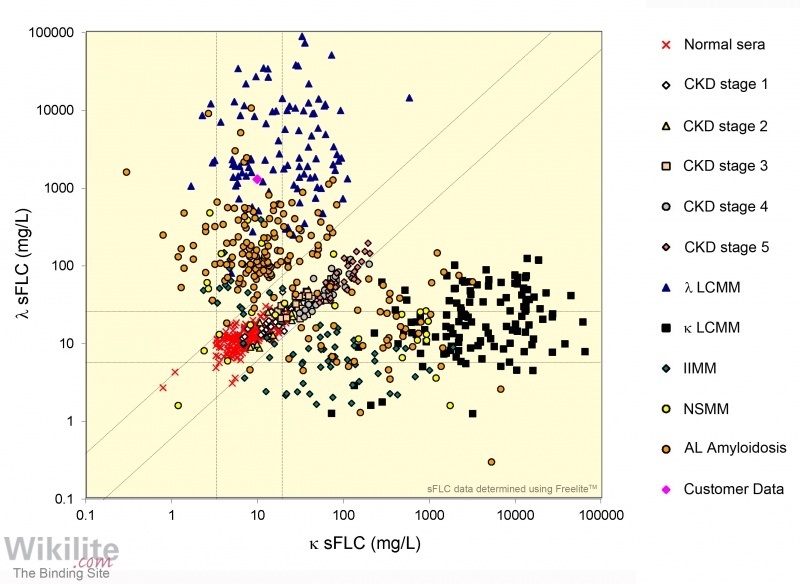 In some cases it may be helpful to plot an individual patient’s result (or an entire cohort of patients’ results) on a FLC dot plot (Figure 7.3). This is a graph displaying κ sFLC concentrations (x-axis) against λ sFLC concentrations (y-axis), both on logarithmic scales. The limits of the normal reference interval for the κ/λ sFLC ratio are represented by two diagonal parallel lines. Each patient result is represented by a single point. If the κ/λ sFLC ratio is normal, the result will fall within the parallel lines. For monoclonal κ or λ sFLCs, the result will lie below or above the lines, respectively.